Following on the heels of the January 24, 2017 announcement that Stephanie Stebich is departing Tacoma for the Smithsonian American Art Museum, Tacoma Art Museum (TAM) is efficiently implementing its succession plan. The museum is pleased to announce Tacoma business leader Mark Holcomb as interim executive director, effective January 25. Holcomb has deep experience in business operations, with a master’s degree in organizational development and bachelor’s degree in international business from University of Washington. During his tenure at Goodwill, Holcomb increased revenue from $38 million to $72 million among other significant accomplishments. His previous professional roles as vice president of operations at Rodda Paint and operations and marketing manager at Parker Paint Company have provided Holcomb with extensive budgeting, metrics, market assessment, business expansion and operations experience. Holcomb grew up in Tacoma and attended Wilson High School. He and his wife both enjoy their work, and like to travel in their free time. Holcomb looks forward to meeting visitors and members at TAM’s upcoming opening celebration for The Outwin 2016: American Portraiture Today on February 4, 2017. 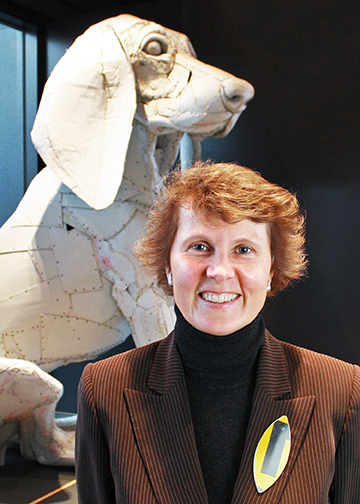 Congratulations to Stephanie Stebich on her new role as The Margaret and Terry Stent Director of the Smithsonian American Art Museum in Washington, D.C.
During her almost 12-year tenure as TAM’s executive director, she has transformed the small, regional museum into a nationally recognized institution. The museum’s focus on exhibitions and programs dedicated to the art and artists of the Northwest has helped to garner six key collections and expand the museum’s square footage with an expansion in 2014 and another scheduled for 2018. Notable collections added during Stebich’s tenure include the Anne Gould Hauberg collection; Erivan and Helga Haub’s gift of the Haub Family Collection of Western American Art; the gift/purchase of the Paul Marioni Collection; the promised gift of the Rebecca and Jack Benaroya Collection; the promised gift of Vasiliki and William Dwyer Collection; and the bequest of jewelry by designer Mia McEldowney. Stephanie has also championed many groundbreaking and celebrated exhibitions and overseen more than 100 during her years at TAM; some highlights include The Art of Eric Carle; Edo to Tacoma: Japanese Woodblock Prints from the Collection; American Chronicles: The Art of Norman Rockwell; Photographic Presence and Contemporary Indians: Matika Wilbur’s Project 562; Art of the American West: The Haub Family Collection Inaugural Exhibition; Eloquent Objects: Georgia O’Keeffe and Still-Life Art in New Mexico; Art AIDS America; and last spring’s Edvard Munch and the Sea. While she will be sorely missed by our members, patrons, and the team at TAM, we are thrilled for her to have this challenging opportunity to be at the helm of a prestigious, national art museum, live much nearer to her wife Dr. Anne Radice (director of the American Folk Art Museum in New York), and to return to her east coast roots.